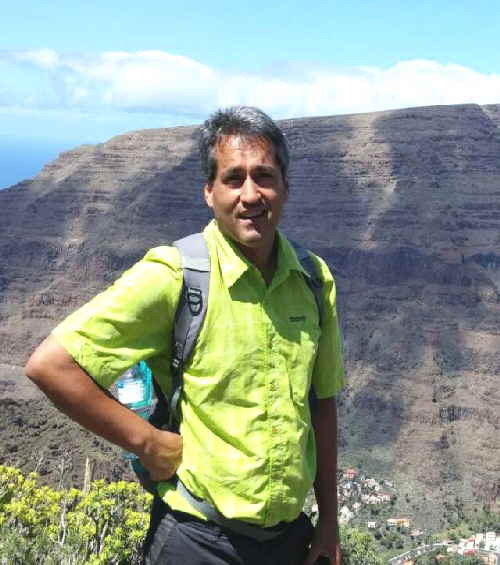 Welcome to La Gomera, the walking paradise. My name is Ricardo Tomé. After working in the National Park I now make private tours, especially walking tours, in the best places of the island where I was born. All walks are à la carte, according to your interest (flora, fauna, local customs) and also your fitness. Contact me to book your day, choose your walk or let me show you the best. You will see the best places and will have more time to enjoy the sun and the sea. LA GOMERA with its lush forests, the breathtaking ravines, and the green valleys was made for the hiker. Come with me to discover with each step exceptional landscapes that take us back to other times. Landscapes sculpted by the sea, such as its steep and massive cliffs, or aged by the passing of centuries, as in the Garajonay National Park, declared by UNESCO as the Property of Humanity. A vestige of the Tertiary period, Garajonay is a forest where one can become acquainted with the history of the world. Prehistoric vegetation, nurtured by the waters of its many springs, awaiting the traveller who enters its magic. I will show you the best routes for exploring the attractive features of this National Park. But there's more on the island. I will lead you through an abundance of paths and tracks which will take us over an intricate terrain, through small villages, ravines or terraced agricultural land. Palm tree covered valleys embracing small but attractive beaches or the incredible image of Mount Teide - lying majestically in the distance, on the neighbouring island of Tenerife - could be a perfect ending for an unforgettable excursion. By the way, I also enjoy walking in the English Lake District. Please have a look at my photo gallery, too.